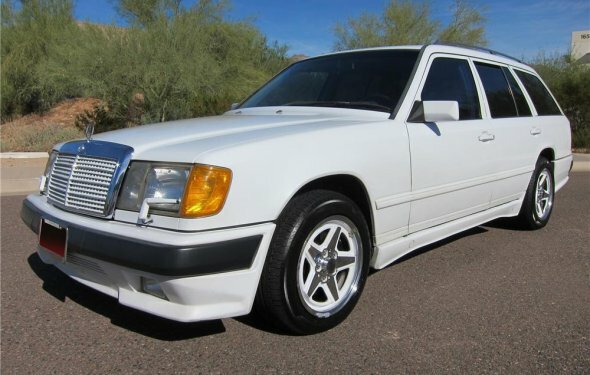 This 1991 Mercedes 300TE 4matic station wagon is the first we have seen with a lifted suspension and all terrain tires. A bunch of people are jumping on the bandwagon to create safari-style Porsches with knobby tires, but not enough people are doing it with Mercedes. We love this set-up, and the seller says that the 4matic differentials offer locking that he is attempting to control individually. Find it here on Craigslist in Shoreline, Washington for $5k. Special thanks to BaT reader gooffer for this submission. This W124 looks better than we would have expected at this ride height. The auxiliary lighting looks only okay, and we would upgrade to modern LED bars or pre-HID Hella or Bosch round units. The roof mounted spare adds to the look but we’d want to make sure it was the same size as the mounted rubber. The seller notes a problem with the transfer case, but does not make clear whether it prevents the car from driving. The engine bay looks stock and the 3L/auto drivetrain should be adequate for the light offroading that this build will encounter. We think it would be best suited to 12″ of snow.